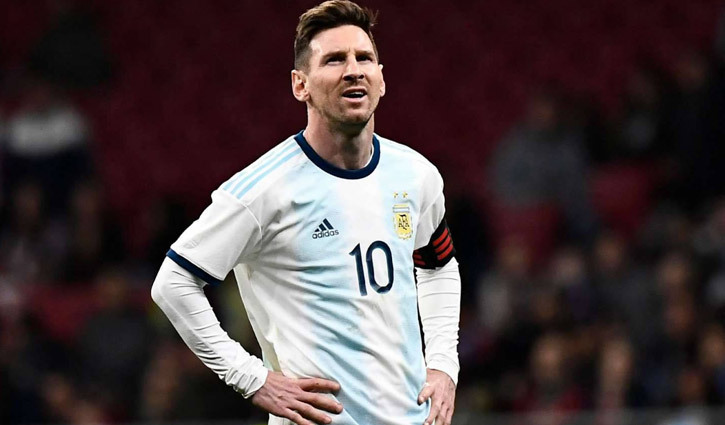 Sports Desk: Lionel Messi has been ruled out of Argentina's friendly against Morocco on Tuesday after suffering a groin injury in the 3-1 loss to Venezuela. The Barcelona forward played the full 90 minutes on Friday night, but the Argentine federation confirmed after the game he will leave the squad as they prepare for their clash with the African side next week. Atlanta United midfielder Gonzalo Martínez has also been ruled out for Tuesday's game after sustaining a muscular injury in his left thigh. Argentina went 2-0 down in the first half after goals from Newcastle striker Salomon Rondon and former Benfica man Jhon Murillo gave Venezuela a commanding lead at the Wanda Metropolitano Stadium in Madrid. Lautaro Martinez then pulled one back for the Argentines in the 59th minute, but Josef Martinez put the game beyond them with a penalty 16 minutes later. Friday was not the first time Messi has suffered from a groin problem, with the Argentine having missed time in 2016 and 2017 due to a similar injury. News of Messi's injury will be particularly worrying for Barcelona, with the 31-year-old in the middle of yet another brilliant campaign. Messi has netted 39 goals in 36 games in all competitions for the Blaugrana, who are still alive in their chase for a treble this season. Ernesto Valverde's side have a commanding lead atop La Liga, sitting 10 points ahead of Atletico Madrid and 12 points in front of third-place Real Madrid. Barca took down Real in the Copa del Rey semi-final and have advanced to the final of the cup competition, where they will face Valencia on May 25. And Barcelona have also advanced to the Champions League quarter-final, where a mouthwatering matchup with Manchester United awaits. The Blaugrana do have a week before their next match, a Liga encounter with Espanyol at Camp Nou. There will be another two games between that match and the first leg of the Champions League quarter-final, which takes place on April 10 at Old Trafford. With Messi potentially out, the scoring onus will fall even more on forward Luis Suarez, who has netted 21 goals in 38 games in all competitions this season.